We have left out a portion of the article on "Honor Your Professional Legacy" in our November/December 2008 printed Newsletter. Our apology to Inge Horton for the oversight. You will find the complete version of Inge's article in the Nov/Dec 2008 online newsletter. Candace Hyde-Wang graduated from U.C. Berkeley in 1973 with a degree in Architecture. She worked for the Oakland, Berkeley and Emeryville Redevelopment Agencies in housing planning and was the lead planner for the Savo Island Low Income Housing Cooperative in Berkeley. She obtained the first Section 8 set-asides for mentally and physically handicapped persons in Berkeley in the mid-1970's. Beside building many custom homes, Candace got her real estate license in 1988. She started her career in earnest with the recession in 1992 which made building virtually impossible. She has since developed a specialized service she calls Real Estate by Design that has added hundreds of thousands of dollars to a home's value prior to sale. Two elements of her training have been essential in the development of the Real Estate by Design process. One was her development background. New construction has always been a hard sell in Berkeley and selling it offered a chance to analyze how Buyers evaluate homes and what strategic changes might make a home sell more easily for more money. Then in the early 90's, Candace went back to Berkeley and took various psychology courses, including cognitive science and learned about how people make decisions and how perception is shaped. This helped her analyze what is important to people in the home that they buy and how to make those sensibilities a priority. Sellers of homes have opportunities to appeal more successfully to Buyers by developing their properties prior to sale, an opportunity enhanced because their holding costs are practically nothing. Candace has also developed a specialized Buyers service that offers greater expertise in soils, structure and development potential than is generally found in Real Estate practice. She helps her Buyers make strategic changes after sale to enhance the value of their property. All of her work is directed by a strict notion of Fiduciary Duty. Inge Horton has asked OWA for $5,000 to help her publish her book. The funds are mainly to be used for obtaining historic photographs and the necessary permissions for her book on Pioneer Women in Architecture. The draft of the book is completed and a publisher has offered to publish it. OWA will be sending out another email asking you all to vote on this issue. If you like, you can forward a yes or no vote to me at carolyne@owa-usa.org. Please title the email with Inge's book. All members are welcomed to attend any OWA meetings, including the Steering Committee meetings. Not only are you welcomed, we encourage you to come and get involved. We are always seeking out members who would like to help with lectures, tours, by laws, and the OWA-AIA reception. Please contact any member or the Steering Committee for more information. Mui Ho has nominated Judy Rowe to join the Steering Committee to replace Stacy Webb who will be leaving the Steering Committee soon. Judy has agreed to come on in May 2009. On behave of the families we serve, Hamilton Family Center would like to thank you for you recent donation of $225 in gift cards for our holiday gift drive. The contribution will have an immediate impact on homeless families and youth in our community this holiday season. At Hamilton Family Center, our mission is to break the cycle of homelessness and poverty. Through a Housing First approach, we provide a continuum of housing solutions and comprehensive services that Promise self-sufficiency for families and individuals and foster the potential of children and youth, all year round. During the holiday season we provide parents with more than presents and parties: we offer families hope in the face of homelessness. This is especially important now. As our economy worsens everyday, we are seeing more people turn to us in need. Our shelters are filled to capacity and the wait for a bed exceeds 100 families. Additionally the number of requests for food assistance from families we placed into permanent housing this year has doubled in the last two months. It is a vitally important that we continue our work. Your donation helps us do just that! Once again, thank you for partnership with Hamilton Family Center in our campaign to end poverty and family homelessness. Your support makes a true difference and helps families in need as they work to regain economic self-sufficiency, permanent housing and brighter future. Carolyne graduated from the University of Washington in June 2006 with a degree in landscape architecture. Along with her degree she completed a two year program on Restoration Ecology at the University of Washington's College of Forestry. While in school she also completed two student internships and served as the student representative for the Associated Students of the University of Washington's Campus Landscape Advisory Committee, 2005-2006. She was also privileged to participate with a select group of six students from UW who went to Japan to compete in an International Student Garden Design Competition and won the Best Design Award. Carolyne worked for a firm in San Francisco on urban infill projects. She is a volunteer with Golden Gate National Parks working on the early detection of invasive plant species. As a Wildlife volunteer with East Bay Regional Parks, she is monitoring the activities of various species under environmental protection. As our new OWA Steering Committee member, Carolyne would like to work on the newsletter and be our new editor. 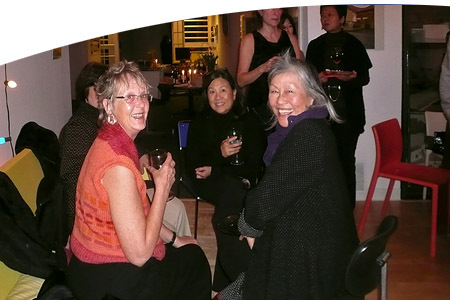 A few words about the International Archive of Women in Architecture (IAWA) may be helpful. Architecture professor Milka Bliznakov, Ph.D. established the Archive in 1985 for the purpose of preserving the work of women architects and thus allowing research on the contributions of women to the field of architecture and related professions. Since then, the IAWA has grown significantly and houses a truly international collection. The Guide to the Collections of the IAWA http://spec.lib.vt.edu/iawa/guide.html provides a good overview of the holdings of the IAWA. Among the women (and one husband and partner) from Northern California who contributed their collections are Olive Chadeayne, Kathleen Cruise, Nan Croley, Jane Duncombe, Audrey Emmons, Lois Davidson Gottlieb, Inge Horton, Steve and Cathi House, Vera Jansone, Sigrid Lorenzen Rupp, Rebecca Wood Watkin, Beverly Willis, and Barbara Woodward. The IAWA also holds records of OWA and the now defunct California Women in Environmental Design (CWED.) Some of the collections are large, while others are small; they all reflect different practices and projects. Everybody's contribution is welcome. It's two and a half years of my service to OWA on the SC as newsletter editor. I have enjoyed and learned and hopefully contributed more than I gained to this Wonderful and unique organization. While the wonderful opportunity for those of us that work as sole practitioners or in micro offices. My circle of colleagues is much larger than would have been possible without OWA. We meet people we never would have. OWA is unique and needs to continue to fill that special niche. We are not AIA Lite nor do I think we should be. Volunteering is not a job while it should have a commitment like a job, it should be handled with care so it is not taken so seriously, it is easier than the workplace. I think it is healthy for the OWA steering committee to look at organizational effectiveness, integrity, and drift. It has been 35 years since we envisioned the organization and times have changed. However, many creative, feminist, and democratic principals were at the basis of the organization's foundation and they may still be valuable. In that spirit, I feel the essential task for the OWA steering committee must be to determine an open process where structural and procedural change will be transparent and inclusive for all interested members. For many years I have been a member of OWA. I have served on the steering committee twice, and continue to stay involved by attending events and keeping in touch in various members. This has been and continues to be a rewarding and pleasurable experience, which enriches my professional growth. There are many qualities of my relationship with OWA which I would like to promote to the membership, including volunteerism, supporting women professionals, camaraderie, and discussions and insight of design concepts and issues. From my first involvement with the organization, I felt welcome and appreciated. Those feelings grew as I became more involved. Unlike other professional organizations, which donâ€™t allow one to relax and enjoy the moment, the OWA membership is supportive and non-judgmental. This allows its members to form bonds or friendships which nurture each other rather than compete. These friendships are based on both personal compatibility as well as professional respect, a very rich combination. OWA has created the professional arena from which I have developed lasting friendships. This has given and continues to give me rich interactions where design concepts and objectives are discussed and revealed, resulting in my better understanding of a project and contributing to my professional awareness and growth. Whether traveling with OWA members, visiting a museum, or attending the holiday party, our conversations affect me on both a personal and on a professional level, as I think about and question design issues which may have passes me by. These are unique relationships, which I appreciate and value deeply, and which I expect to continue and grow for a long time to come. I am always delighted to meet new members and find out about their work. I value working with the Steering Committee members, as it really helped to get to know other OWA members. There is some confusion on the length and terms of the Steering Committee. From past experience, we found that staying on one year plus and no more than two years worked well with most members. It is not too long a commitment and at the same time, it is long enough for SC members to work well together. Since it is volunteer work, we would not like to use too much of our members' time. SC members are usually happy to be released of duty after a year on the Steering Committee. When SC members step down, usually they continue working on various OWA events or helping out in meetings. Volunteering their time and expertise have been the strength of this organization. We are proud of these inputs from all our members. To renew your membership click here: OWA MEMBERSHIP RENEWAL. You will have to log-in to view your renewal form. OWA membership is February 1 to January 31 each year. 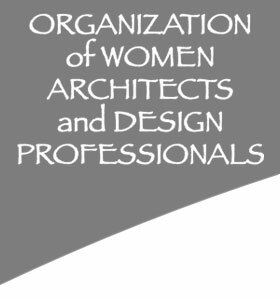 The Organization of Women Architects seek to improve the professional standing of architects and women designers, increase the number of women in the design professions, and increase public awareness of and interest in the design professions. The organization is led by a non-hierarchical steering committee staffed by its members, each serving a limited term.